Directions: This is an overlook of Colorado river meandering in a horseshoe shape down stream from Glen Canyon dam. Panoramic views to the west. The scale of the canyon and the river below are breathtaking. 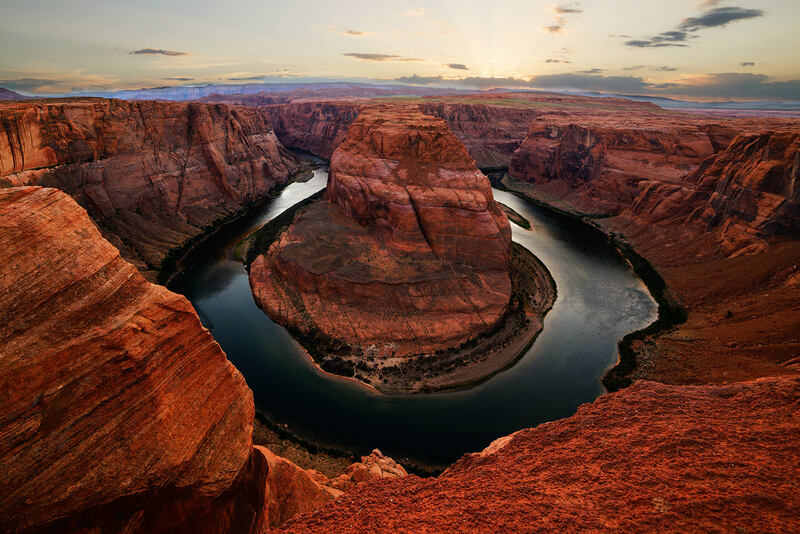 You can reach this amazing view point with an easy drive from Page, Arizona. Turn for the parking lot is marked well on Hwy 89. This spot is so amazing I would even recommend driving from Grand Canyon. Ideal trip would be to spend at least 1-2 days in Page, Arizona. Antelope Canyon, Glen Canyon Dam are only minutes away. Monument Valley and Bryce Canyon are only couple of hours away but in opposite directions. Easy to get to, no need for tickets and careful planning. But it does require 15 minutes of hiking in loose sand. There is plenty of parking but to get best spot on the edge arrive early. Do not rush when you are close to the edge. Be mindful of people around you. The rocks on the edge are uneven so be extra careful with your tripod. You will be exposed to elements – bring water and bring extra layers when cold. Sunset and sunrise are the best time. Sunset will be extreme dynamic range looking into the sun – bracket your shots. Sunset may also need bracketing because canyon will still be in shade. Bring your widest lens. 14mm on full frame was barely enough to get the whole scene. If your lens is not wide enough take panoramic shots and merge them later.